IWASSA Co.: You can now see how many times your profile in Show "Google Plus"
You can now see how many times your profile in Show "Google Plus"
Google Plus social network added a new feature that allows the user to know the number of times View Public Profile by visitors and users of the social network, and thus determine the number of times watching others who publish content, including forms and appearances and public profile page. 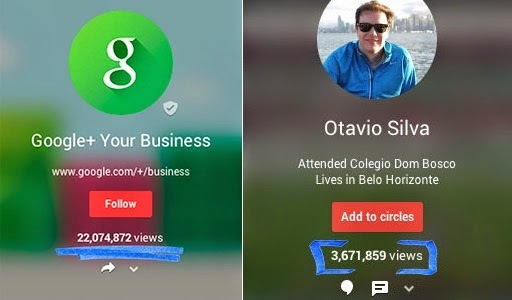 This feature is provided by Google Plus also for pages, showing the number of times the page views by visitors, as anyone can see the profile of another person or his, and knowing the total number of views, but in the event of views does not appear, it means that the account holder prefers not to be included on the Public Profile. It can certainly choose to hide or show the number of times watching your profile and other content, be it through the Account Settings, and then Profile field, and then remove Althddid option for "displaying the number of times you see the content of your profile." And even now can not control this feature and Illt by Android devices or iOS, and therefore you rely on a computer in case you want to hide or re-show the figure of the new, with the knowledge that it appears by default now. This Google has made it clear that the number of views may not be accurate, as it is not updated in real time, but it is somewhat good enough to give you a glimpse of which you can find out how to interact with your PC or your page on Google Plus network.